One of the most used and most important features! Great for providing quick access to governing documents, meeting minutes, financial reports, and more. Display contact information and titles for each member of the board. Customize what contact information is shown using your privacy preferences. Compose news articles for updates, announcements, and more. You can even opt to highlight recent articles on the homepage. 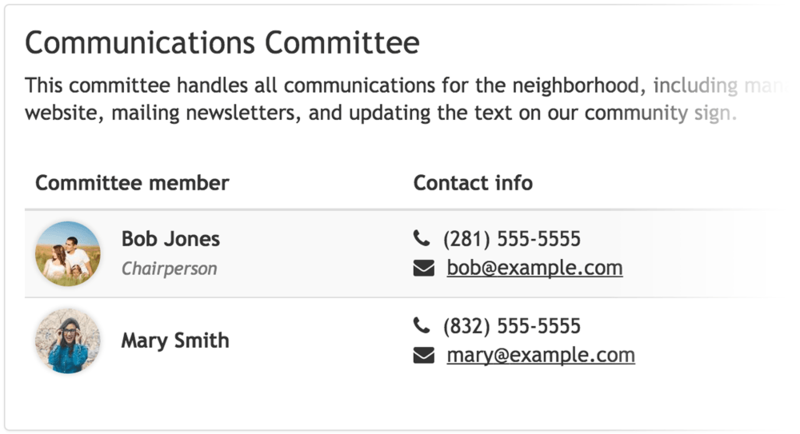 Display a description of each committee's role, plus list members' names and contact information. Let residents share their contact information securely with neighbors. Detailed privacy preferences permit full control over what information is shared.